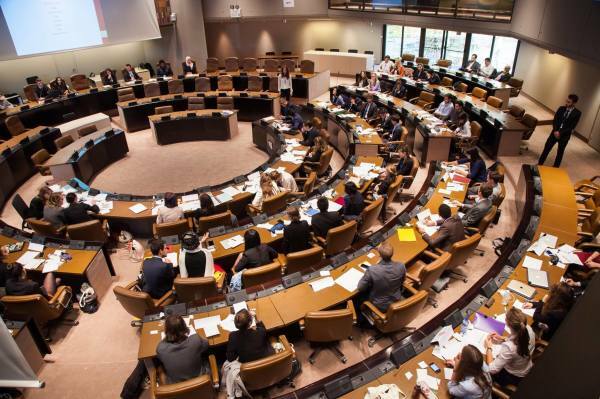 Model United Nations, also known as MUN, is an extra-curricular activity in which students typically role-play delegates to the United Nations and simulate UN committees. BOMUN is the event organised by Bordeaux Model United Nations Association. Participating in a MUN conference is a great opportunity to develop your communication and critical thinking skills and develop solutions to real world problems. Everyone is welcome to participate to BOMUN 2017.
have participated to previous conferences:we will teach you all you need to know to become the best delegate ! be a specialist of the Arctic, we will provide background information on the Arctic council and the Arctic region. The conference will be in English. We will organise a briefing about the topic and the rules of a MUN conference before the conference. 9:00 Meeting at Sciences Po Bordeaux, salle Copernic. Breakfast offered by the MUN Sciences Po Bordeaux. Explanation of the rules. Meeting with the chairs. 16:30 End of the Conference. ​ Coffee and snacks offered to end the day. You have never been a delegate at a MUN Conference? No need to worry! What are points of inquiry? What is the difference between a moderated and unmoderated caucus? Before the conference, we will organize a meeting in order to explain the rules to you and talk about the topic. You can also contact us for any question. We have prepared a document (here) in order for you to learn about BOMUN rules, and the vocabulary that will be used in the conference. Every Member State of the committee shall have one vote, except for the observers and non-members whose voting rights are limited. 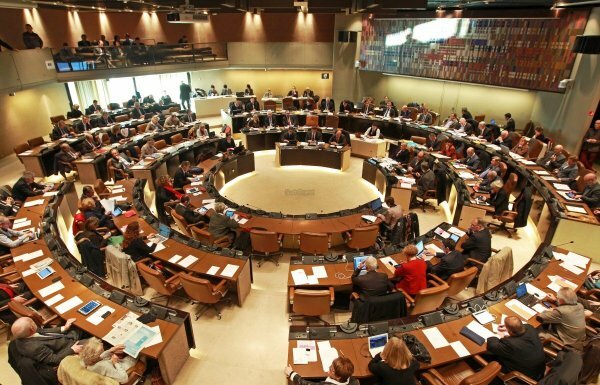 Member States can vote on both substantial (amendments and resolutions - absolute or qualified majority is needed) and procedural matters (points and motions - majority of the members present suffices). Observers (other states, with non-state actors excluded) can usually vote on procedural matters only (depending on a particular MUN committee). How to write a position paper? Each delegate needs to write a position paper. It will help you define the position of you country. You can send the position paper to the chairs before the conference for advise. The Position Paper is a one or two page document that is essentially a summary of your knowledge of the topic and the position your country plans to take when it enters committee. It typically contains four sections: Background of Topic, Past International Actions, Country Policy, and Possible Solutions. 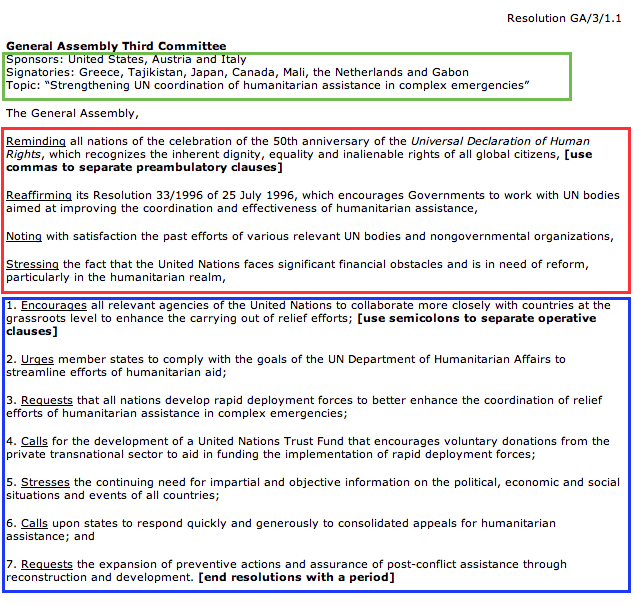 Past international actions: The UN website, and your committee’s website are very useful. You need to research the key treaties or resolutions mentioned in your background guide, UN or NGO reports. Country policy: What is the position of your country of the topic? Visit CIA World Factbook, your country’s foreign ministry website, domestic programs within your country, and your country’s voting record on key treaties or resolutions. The aim of the conference is to write a resolution. What is a resolution and why is it important? A resolution contains all the proposed solutions to a topic. Learning to write a resolution is very important because the ultimate goal of the committee sessions is for delegates to come up with written solutions to the problems they are trying to solve. Working paper: Working papers are just a list of ideas formed by the blocs. They may or may not be written in resolution format. The working paper needs to be approved by the chairs. Draft Resolution: A document written in resolution format, approved by the chairs, and introduced to committee but not yet voted upon is called a draft resolution. Delegates will be spending most of their time writing and amending the draft resolutions. Once a draft resolution is passed by a committee, then it becomes a Resolution. Sponsors (in green in the example): delegates who authored the draft resolution or actively contributed ideas. They support the draft resolution and want to see it get passed, so they should vote for it. All resolutions will require a minimum number of sponsors. Signatories (in green in the example): delegates who wish to see the draft resolution debated but may or may not agree with all of the ideas. However, they think there is some merit to it and want to see it presented. Some resolutions will require a minimum number of signatories. Pre-ambulatory clauses (in red in the example): statements in the first section of the draft resolution that describes the problems that the committee wants to solve as well as previous measures taken to combat the problem. Pre-ambulatory clauses are usually italicized or underlined but not numbered. Operative clauses (in blue in the example): statements in the second section of the draft resolution that outlines the specific solutions the sponsors wish to implement. Operative clauses are usually numbered and underlined. Amendment: a change made to an operative clause of a draft resolution. Amendments can add, delete, or change an operative clause in a draft resolution. A Friendly Amendment is an amendment written and approved by all the sponsors to a draft resolution and is automatically included into the text. An Unfriendly Amendment is an amendment not approved by all the sponsors to their draft resolution and must be voted upon before it can be included into the text.